Manilla Road is truly the band that would not die. Never caving in to whatever the prevailing trend was (be it grunge, death or glam), the Wichita, Kansas band had a career that defied the odds and managed to release some outstanding epic heavy metal during the 80's and early 90's. Their sound was completely unique, ranging from wild thrash to Rush-like epics to brooding doom. Lead guitarist/singer Mark Shelton was one of the most talented frontmen in American metal. Yet despite the talent the band obviously possessed, they never made it past cult status and broke up around 1993. But the flame of metal burned too brightly inside of Mark Shelton, and now Manilla Road (much like Atlantis) has risen again. This is no mere "cash-in" reunion designed to strip nostalgic headbangers of their hard-earned bucks. 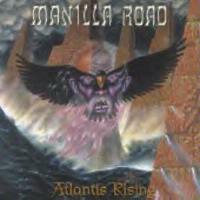 Manilla Road in 2001 are more vibrant and creative than ever and "Atlantis Rising" is their best-produced and most challenging record (though I will always have a fondness for "Crystal Logic"). For the first time ever, a Manilla album boasts a crystal clear production, allowing the musical complexity to arise. The pace here is generally moderate, giving it a more majestic feel, but there are bursts of speed and power. Shelton's screaming guitar is literally all over the place - the man can cut loose with a solo at the drop of a hat. Not only that, but his unique vocals, often criticized because of their "reediness", have broadened as well. They now include some genuinely haunting melodies as well as a new found fierce growl that enters the realm of death metal. Much like King Diamond, "The Shark" takes on several personas during the course of the record. He is ably abetted by new members Mark Anderson on bass (a very nimble-fingered player) and drummer Bryan "Hellroadie" Patrick. With the exception of opening track "Megalodon", which stands alone, "Atlantis Rising" gives us Manilla Road's most enormous fantasy concept piece yet. It involves the return of Atlantis (Atland) to the surface after millennia, the betrayal of Atland's King by the Sea Witch, the destruction of most of the world by Cthulhu and the march of Odin, Thor and the Norse Gods to defeat the Great Old One and his evil spawn. That's not exactly something you'd read about in the latest Linkin Park album. This is a very strong and very welcome return of a band who deserve a second chance to dominate heavy metal. "Atlantis Rising" is a deep and fascinating record that is not totally instantantaneous but which sinks in deep and leaves a lot more lasting impression than most other heavy metal being released today. The only song not involved in the "Atlantis Rising" concept, this instead relates the tale of a monster prehistoric shark (which actually existed). It begins with a spacy tone that was first heard on MR's "Out of the Abyss" LP, then goes into an almost jazzy bass-drum riff before some crushing doom chords come in. The riffing here is very heavy, but off-kilter and not typical. Shelton hasn't lost a damn thing in the last 8 years, as he rips away with some searing solos. This is a menacing, stalking kind of track. This begins the record's main concept piece, as the inhabitants of Atlantis, living for millennia in the coral caves of Lemuria, prepare to rise ancient Atland to the surface again. It's a brief song propelled by a swirling bass arpeggio and characterized by some eerie vocals from Shelton. This is a quiet but penetrating cut. A much more metallic track heralds Atland's rise to the surface. The main riff is rigid and staccato but there are some lush melodies on the chorus. It also includes more great lead work from Shelton, who is surely enjoying himself. This creepy ballad may first dismay headbangers but it has a way of getting under your skin. The chorus is lovely but disquieting, with lyrics like "Fatal beauty conspires/To usurp the throne of the King/For Cthulhu shall rise/When the Witch casts her spells to the Sea". The track heavies up in the last third but retains its dirge-like, doomy quality. This is the purest headbanging cut on the record. I detect plenty of early Metallica style riffing in the mode of "The Four Horsemen" and "No Remorse" here, mixed with a feeling of 80's power metal bands like Omen and Attacker. It includes killer riffing, with Shelton showing his new death growl as he roars "RIIISSEEE!". The song relates Cthulhu's return to Earth and his attack on Atland. The heaviness continues here. "Decimation" has a very dark feeling to it, never crossing to death metal but somewhat evoking that feel. Shelton's vocals are raw and nasty as they spit out lyrics like "Dark winged minions of Hell/Brought forth to poison the Well/Silencing Poseidon's Bells". There's a galloping riff at the end that reminds me a lot of Sabbath's "Children of the Grave". Pretty appropriate, as the song relates the destruction of the world at the hands of Cthulhu and his black horde. This is a beautiful acoustic ballad, evoking the feel of ancient times. With a very memorable chorus, the song briefly relates how Odin learns of Midgard (Earth)'s destruction, and it leads right into the next piece. One of the album's best, this is a metallic cruncher with a very appropriate "marching" feel and those doomy, epic riffs on the chorus for which Manilla Road is famous. It's a track that screams metal at the listener and perfectly relates to its lyrical subject, as the Gods of Asgard prepare to go to war against the Old Ones. This begins with the purest thrash on the record, as Shelton yells "ATTTACKKK!" over ripping speed chords again reminiscent of early Metallica. Then it settles down into more of a traditional power metal song. I'm always amazed at how the band can summon that true medieval/dark ages feeling with their riffs and vocal patterns. The track ends with a burst of pure guitar noise and feedback, as the Asgardians manage to destroy Cthulhu and his minions. Boy, epic is not the word for this one. 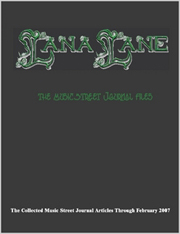 If you loved old Manilla Road classics like "Helicon" and "Dragon Star", this will be right up your alley. Those slow, rolling chorus riffs are so majestic and noble. More great guitar soloing abounds, and I love how the pace quickens in the middle. The track recounts how Odin and Thor recreate Atlantis and Earth after the decimation of the Old Ones. The album ends as the sounds of a raging storm are heard in the background. Hail to thee, Manilla Road! Arise, all ye faithful to the sword!